When entering Disneyland Park, from Main Street to sleepling beauty castle carved pumpkins, corful orange and yellow bunting will be on Victorian architecture. Near Town Square, have a look at an amazing invention intended to make surprising candies! Different look for the characters when they join in the spirit of the season and appear in their Halloween costumes. 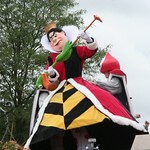 Of course, the Disney Villains will be out in full force near the castle to celebrate their favorite time of year. In the Park Disneyland on October 31st. Come dressed up and discover the Park Disneyland as you have never seen it. An experience to live in family or between friends from 9 pm till 1 am in the morning. 35 € (30 £) a person free under 3 years old. 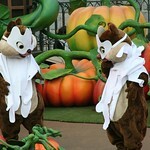 A "must do" for Disneyland Paris halloween! 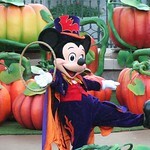 It's time to buy the Disney's Halloween Party tickets! Choose UK for country and english for langage! More terrible than never, on October 26th and 27th in the Park Walt Disney Studios from 8:30 pm till the 1 am in the morning. This year, the evenings reserve a new surprise: an unpublished film made by the famous author Maxime Chattam in one of the attractions of the Park Walt Disney Studios. Some rides are even modified and take the visitors to the discovery of alarming experiences. Buy the Terrorific night tickets! Every night, near the beauty castle, enjoy the fireworks! Most of the colours of the show stages the biggest Disney Villains. Every day, on the Theater of the Castle, Mickey and Minnie disguise as vampires, Donald dresses his costume of small roguish devil, Dingo in skeleton and Daisy puts her bat dress. A must do for Disneyland Paris Halloween special toddlers! Every day, in the Yard of the castle (Fantasyland), meet the disney's villains with their costumes. Every day, on Town Square, a smoke escapes from a strange machine with candies. Designed by dingo, created specially for Halloween, this funny machine give the secrets of the manufacturing of candies. Dingo made personally some appearances for Candies distribution! Near the Haunted Mansion, in frontierland, the area has been transformed into a Tim Burton ‘Nightmare Before Christmas' theme. Faithful reproduction of Tim Burton's universe, The Cemetery of Jack and Sally is unique, specially created for the Festival Halloween. Private and exclusive meeting in Fantasyland (stage called "meeting mickey" near the toad hall restaurant. ): Mickey wil have his halloween costume! Mickey lends himself very gladly to a small photography session together with you. The Magic Disney in Parade! On main street, every day, enjoy the traditional parade for the 20 years of Disneyland Paris. The character Disney dresses their magicians' new costumes to celebrate the 20th Anniversary.